Day 649 - FRIDAY! HOORAY! I'm going away AGAIN with some gals from former work for the weekend, leaving after work today. Charlie is loading stuff into my car for me. Isn't he NICE? I've packed some movies and some popcorn so we should be all set! I want to check the weather forecast, hold on a second... Looks fine, chance of rain on Sunday but that's not a problem! Well gang, no time for bloggage, got to get ready for work and play! TTFN! Day 648 - One Week Since Thanksgiving! 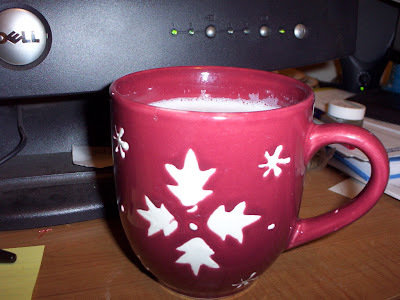 I bought a new and GIGANTIC foame' latte' mug yesterday, with an appropriate winter theme. It's HEAVY! 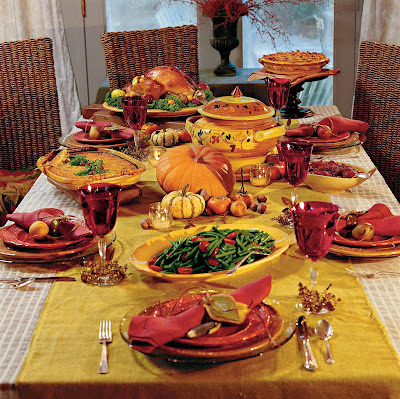 Can you believe it was a week ago today when we had our Thanksgiving Feast? Are all your turkey leftovers gone? I didn't HAVE any turkey leftovers! I have GOT to buy and cook a turkey, and SOON! After cooking a turkey, I take it all apart and look forward to having several containers of turkey stored away in the freezer for quick meals! Waaah! Hey - I was talking to someone yesterday who says she cooks a boneless turkey roast in her CROCK POT! She defrosts it first, and lets it cook there all day at 250 degrees. I am going to try that after Christmas. Why after Christmas, you ask? Charlie doesn't know it yet (till he reads the blog), but I am going to ask for a bigger crock pot for Christmas. I just need to research what kind is best. Please post comments. I want at least a 5.5 or 6qt one with a digital display and settable temperature. And a dishwasher safe liner. It's 6am - gotta run! Have a great Thursday and Survivor tonight! 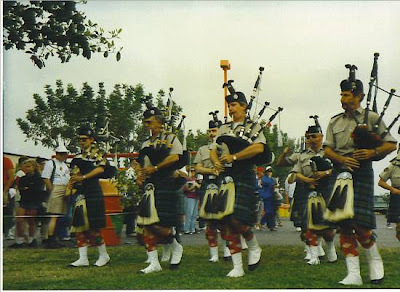 This is going to be a very short blog, it's 6am and I've been fighting with the computer this morning. We have two accounts on this computer - one for Charlie, one for me. The internet browser works from Charlies account, and doesn't from mine (since yesterday). Sheesh. Remember my blog about appliances and things breaking around the holidays? My friend Jane at work said her refrigerator kicked the bucket THANKSGIVING DAY! What a nightmare. Her new fridge is getting delivered today, and they've been using the broken one as a giant cooler. Have a safe and happy Wednesday, everyone! TTFN! Day 646 - Tuesday is here, Monday is OVER! 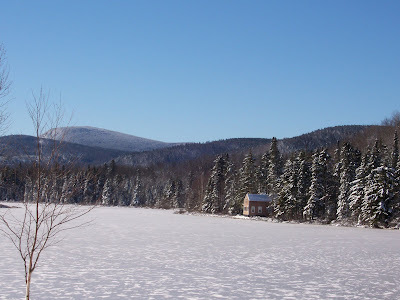 Here is another breathtaking photo from Thanksgiving week - this one of Beaver Pond on Rt 17 in Maine. Notice the water is already frozen solid in the mountains! Have I mentioned we bought a Christmas tree this past Sunday? It is the earliest tree purchase ever! We bought the first and the least expensive tree we saw - $21 at Home Depot. A little 5 foot Fraser Fir. The guy at Home Depot that trims the lower branches and cuts off the end of the trunk remarked 'what a cute little tree'! Yes, it may be short, but we love it anyway. Our little Christmas tree is sitting in the den, waiting patiently for LIGHTS to be put on it. We went out for dinner last night, and I only had time to take out the BOXES of decorations, not actually DO anything with them. I do love having a Christmas tree up, and normally don't get around to it for another couple of weeks. Day 645 - Hoping for SNOW? Heather, here is your snow picture from Maine! You would have seen a nice snow if you had arrived on Tuesday. 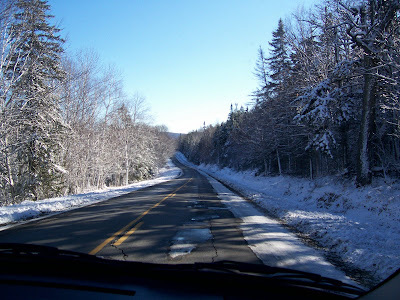 Charlie and I saw the most snow on Monday when we drove up into the mountains to see the scenery. We were headed to 'The height of the land', where you can see all the way to Canada. We had to turn back shortly afterwards because there was so much snow and ice on the road - I wasn't in the mood to crack up the rental car. You can see the snow on the right hand side of the road. The higher the elevation, the more snow we saw! The weather in Tennessee this week is expected to be 30's-40's at night and 50's daytime. That is perfect in my opinion! We don't get much snow, a few inches here and there and an occasional 'big' snow. I haven't used the 4-wheel-drive yet on my new CRV. Tennessee is a great place to live, but I do miss being near the ocean! We are a whopping 8 hours from the beach. I don't miss the New England winters though! I had my fill of cold last week, and if I don't see snow again till next winter, that is A-OK by me. Changing subjects back to Thanksgiving, we had over 100 people at our Thanksgiving dinner, and we didn't run out of turkey, stuffing or gravy! I poured the gravy into PITCHERS so people could pour it right over their plate. Next time I'll pour it into coffee carafes so it will stay piping hot (not that anyone complained, I just had that idea after the fact). Hey! It's 6:08 - gotta go! Have a nice Monday and hope you had a great Thanksgiving! Day 644 - Back home from the frozen North! 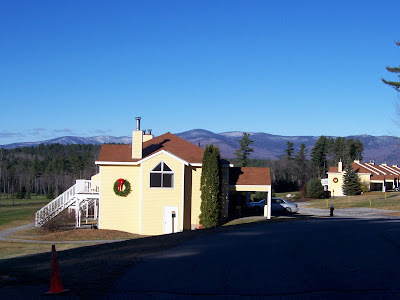 This is a picture of where Charlie and I stayed this past week in Bethel, Maine. See the beautiful mountains? Lovely, lovely, lovely! We had a good trip back yesterday, no trouble returning the rental car, flights on time, etc. We had a wonderful time, got to see lots of family, and ate constantly for a week! What more could anyone ask for? TTFN - gotta make breakfast and go swim! Day 638 - Lobsters in a snowstorm! My mother has a new CPU, so I got online to say hello. HELLO! We are going to have lobsters shortly - what could be better than that? We were going to go out for lobster today, but due to the snow, we are staying in! My brother and family is here from Wisconsin, my son drove up this morning from Rhode Island, and we are having a snowstorm. It started snowing around 9 am this morning and there's a couple inches so far on the ground, and the plows and sanders are out. We went to the grocery store this morning in the snowstorm, and then made it to Mom's with no trouble. Yesterday we went on a scenic drive in the mountains. We had to turn back when the snow on the roads made driving hazardous. I surely hope the pictures we took came out, it was breathtaking! Have a great rest of the week and a great Thanksgiving! Try not to be too sad! Feel free to chat with each other in the comments section while Charlie and I are busy STUFFING ourselves with STUFFING and other goodies like LOBSTER this coming week. Preliminary agenda includes a pizza party, a lobster dinner OUT, Thanksgiving dinner IN, and a breakfast. How's that for starters? Take care, be safe, and eat well! Don't forget to pack the Pepcid AC! Day 634 - Last workday till vacation! It doesn't really feel like Friday to me, but you know what to do - march in a circle chanting 'Fri-day! Fri-day! Fri-day!'. Here's another delicious looking turkage for Heather. Ignore the brussels sprouts behind it! I have noticed that a lot of photos have brussels sprouts on a Thanksgiving dinner table, and that is NOT anyone's family tradition that I know of... They must think they look artistic. Now, the roasted potatoes I would enjoy, but gravy is better on mashed, in my opinion. And let's substitute the vinegar cruets for wine glasses, shall we? It's almost 6am and I just finished throwing a few more items in the suitcase. If I am going to make stuffing for 100 people, I think I need my veggie chopper with me for the onions and celery. Make more room in the suitcase, girl! At this rate I'll have everything I need for the week EXCEPT clothing in my suitcase. Gotta go, folks! I'll post something tonight or in the morning to say 'Happy Thanksgiving'! 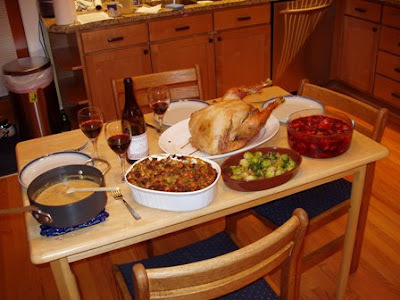 Day 633 - One week till Thanksgiving!!! Blogger is messing up my spacing again. Sorry! 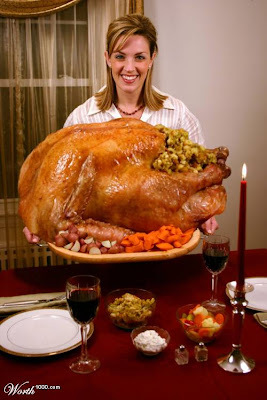 Heather, here is your giant turk-age! For some reason, holidays cause appliances and electronics that we depend on to fail. If your stove, fridge, dishwasher, computer, tv, is needed, it will fail at the holidays when you don't want to spend the money to replace it. My sister Lyn has had a stove and a dishwasher kick the bucket when company was coming. My mother's computer died this week. It's only three years old! Sheesh. Our refrigerator light went out this week, and as of this morning, we have a dead television in our bedroom, THE DAY AFTER CHARLIE replaced the batteries in the remote. Phil and Tiff - are you still reading the blog? The TV that died is the one we bought from you when you moved back to England! I guess it's had a long enough life! I have a lot of my Thanksgiving packing done. I have put my jam, Amish apple butter for Nancy, and some of Joe's honey in plastic biscotti containers in a suitcase. Good luck to the airport people trying to get them out of those containers to see if they are dangerous objects. If they make it to Maine without breaking, good. Day 632 - Midweek and Vacation Coming Up! 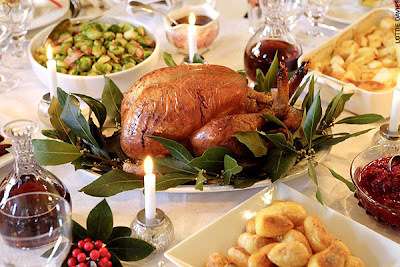 Greetings, Bloggy 'Dreaming of turkey already'ers! I am started to get excited! Can't wait! I think I just gained a pound thinking about it. I am running a little late this morning, it's almost 6 and I haven't started the blog. I checked email and ebay first, that's why. Whew! I hope today will be less busy than yesterday. I do hate Monday, but at least it flew by. Our dinner out with TY and SY was to 'Sultan Table' again for Greek/Turkish food. Three of us had the same thing - a triple combo of marinated chicken, a shish kabob of beef, and a kofte which is a long oval ground lamb 'meatball', with salad and rice. Scrumptious. CONFESSION: I think I mentioned that I made a batch of strawberry jam this past weekend. I want to warn the entire family in advance that 'it's delicious but it isn't pretty'. As a matter of fact, it's kind of funny looking. As a mother, I have to love it anyway because I created it. I let the strawberries defrost first (that I never do) and that resulted in my over-chopping the strawberries when I put them in the chopper. The result is a grainy looking jam. Apologies but please just act like it's normal and pretend it is picture perfect. Greetings, Bloggy Moan-dayers! It's MONDAY. A-gain. The good news - it's going to be 70 degrees today! The bad news - it's Monday. The good news - one more week till vacation! The good news - my Blackberry is working this morning - I let the battery get low and it got pretty screwed up. Did I already tell you that my manager has arranged for me to have a Blackberry that synchs up with my email at work? That really will save me some time when checking the overnight jobs and such, but another piece of equipment to recharge and drag around. Will I bring it with me on vacation? Probably. Heather - post a comment and tell us more about the concert you went to. Inquiring minds want to know more! What was the name and is it touring around the country right now? Yes, I love Christmas music. It's time for me to put some Christmas CDs in my car and start encouraging that Christmas spirit! Day 629 - Craft fair find! It's Sunday already, and that means back to work tomorrow. Five workdays till vacation, but I am so busy at work that I can't get excited yet. This photo is of one of my purchases at the craft fair yesterday- the name of it is 'Autumn Quilt'. Yes, those are real leaves, mounted on a board in an artistic way. Why can't I do stuff like that? Maybe someday when I get to retire. I just love it! I think I might put it in the Den. 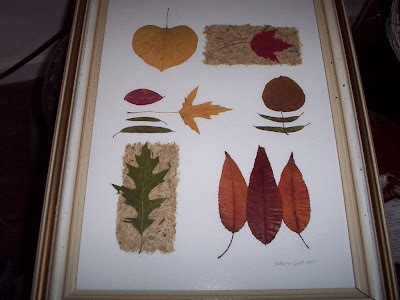 I have two additional, smaller 'Re-Leaf Art' collages that I already put in the guest bedroom. The artist was so happy that I liked her work. I already emailed her some photos of the other 'leaf art' I have around the house. Buddy Joe came over yesterday and spent the night. We had kettle corn from the craft fair for snack-time, Glogg (hot mulled wine) for happy hour, a stir fry for supper, and a big country breakfast of biscuits and sausage gravy, scrambled eggs, bacon, honey from Joe's parent's bees, and apple butter from Amish country. Hold onto your arteries for that one, and BOY it was good. I'm getting a stomach ache already. Gotta go, folks! Have a nice Sunday and TTFN! No time to blog, I am going out the door to water aerobics, then to one of my favorite Christmas craft fairs. Buddy Joe is coming over later for stir fry and egg rolls. Oops, I didn't clean. TTFN and wish me luck shopping! Day 627 - Friday, Hooray! This work week FLEW by. I hope the weekend doesn't fly by so quickly. I was supposed to work tonight and tomorrow on a release, but it is postponed. Instead, I'll be going to my 8am water aerobics class in the morning and a Christmas craft fair after that. It's a tough life. One of my dreams last night was of an L-shaped, high leather-covered desk that was as long as a sofa (and looked a little like one too). In the middle of one side of the desk was a built in, leather covered hot plate and tea maker. The tea didn't go into a pot, it brewed into a saucer sitting on the desk. Very strange. In my dream, I thought it was a little like the 50's furniture on 'Leave it to Beaver', but it really wasn't. It was custom-dream-made and one of a kind. I had some other dreams that I don't remember except bits and bites. Guess I'll go eat breakfast and enjoy it! TTFN and have a nice weekend! Day 626 - Survivor Night! It's Thursday already. How will I ever catch up if the week goes by this fast? Did anyone watch the CMA Awards last night? We don't usually watch, but sometimes having music on is better than whatever else is on TV. What happened to LeAnn Rimes? Did she turn into a 1940's cartoon character? Frightening. Well, Wikipedia doesn't mention her transformation, so I guess she's not bionic, either. What happens to these people when they get famous? They get anorexic and just plain wierd, that's what. And I guess nobody can get through a performance anymore without crying? Maybe the audience should be crying. Well, gotta get ready for work, folks! Have a great Thursday! Day 625 - Midweek and Shivering! Blogger is giving me a hard time with unintentional double spacing this morning. I have saved and re-edited this blog FOUR times already. It's the middle of the week and we have had our first hard freeze- it's in the 20's here this morning. Brrrrr.... I can hear the heat running right now! I dug around this morning to find my gloves to put in the pockets of my winter coat. Yes, that means I'll put on my winter coat this morning. Here's a photo of the beautiful fireplace at the cabin we rented. It was a gas fireplace, so you just turned a timer and presto! A cozy fire. We heat our house with propane, and we usually receive a letter from our propane supplier to 'lock in' a price sometime in September that is good all of the winter heating season. We haven't had any letter yet this year. This may mean they just don't have a good enough read on the estimated propane prices to make their customers that kind of offer. Maybe we'll have to pay as we go this year? I hear there were snowstorms yesterday in Pennsylvania and New York. I hope there ISN'T much snow when we go to Maine for Thanksgiving this year. Maybe snow before we get there and after we leave, ok, Mother Nature? Can I put in my order now? 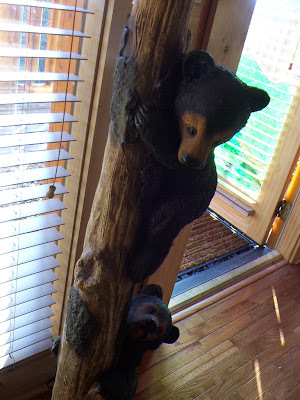 This is a photo from the cabin - it is actually a lamp with little bears climbing up the pole - adorable! The cabin had bears everywhere - toilet paper holders, lamps, remote control holders, decorations, etc. Someone wrote in their guest book - 'Just how many bears ARE there in this cabin'? We wrote in the guest book, of course, telling the owner family how much we enjoying staying in their cabin. I have a training class today on a new software product we are introducing at work. Training starts at 8, and I need to assign out some work before class starts, so I'd better get a move on! Sorry this is short - have a nice Tuesday and dream of the mountains! Note to Joe - we did NOT make a single list this year for our girls weekend out! NOT ONE. That is the first time, ever! Everyone was too busy to coordinate what we were all bringing, but it all worked out just fine. Day 623 - Back from the Mountains! Greetings, Bloggy Commuters! It's Monday already! The weekend went by too fast, even if it was a long weekend away. Seven gals on a 'gals weekend' in Pigeon Forge and Gatlinburg, TN. We cooked in, grilled out, and shopped till we dropped! We also went to a winery and did some wine tasting. We had a great time and PERFECT, blue sky weather. Very nice! This photo is of the view from the deck - can't hate that! The cabin we stayed in was awesome. Three stories, 4 bedrooms plus a loft, 2 jacuzzis, one outdoor hot tub, and a 12 seat indoor theatre. It really was the best cabin yet. A typical day consisted of a leisurely (2-3 hour) morning coffee and breakfast period, then taking showers and getting ready for the day, then getting snacks and drinks into the car, then shopping till late afternoon with lunch out somewhere. We ate rotisserie chickens the first night, made homemade chili the next night, and grilled steaks on our last night. While we were gone, Charlie bagged a deer (a doe) the first weekend of muzzleloader season, so he's happy as a clam. I don't think we got any trick or treaters, or they took SO little candy we couldn't tell a difference in the amount in 'da bucket'. Drat. Hey! I am leaving this morning with 'da gals' from my former work for a long weekend in the mountains of Gatlinburg and the superstore area of Pigeon Forge. Outlet shopping, here we come! 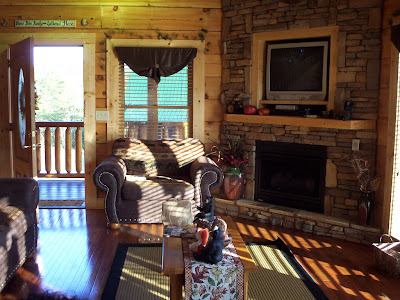 We'll also have a hot tub, and the cabins usually have patios and porches too. 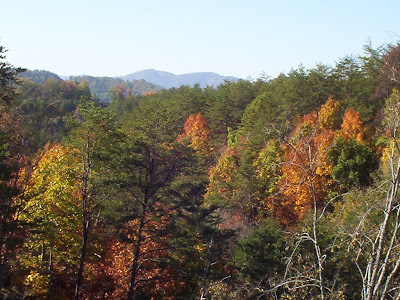 We expect Gatlinburg to be very crowded this weekend, but I don't care. We'll get a lot of our shopping done tomorrow, and Saturday we can go to the places close by. Sometimes we dine out, sometimes we grill out, and we usually cook at least one big breakfast with all the fixins. That will be hard to resist! 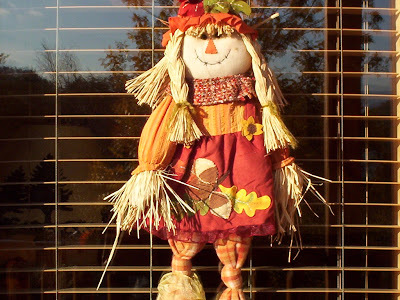 TTFN folks and have a great beginning of November! No bloggage till Sunday!